We always need to add -ing to verbs before using in any continuous tense. 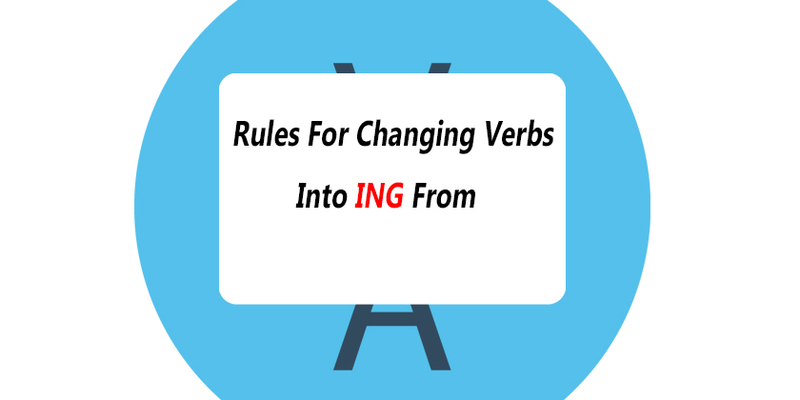 Below you will learn about the complete rules for changing verbs into ING form. 1. For many verbs, we make the ING form by simply adding -ING to end of the verb. She wasn’t feeling very well. 2. Verbs ending with -e (with the exception of verbs ending in -ee and -ie) Drop the -e and add ING. People are living longer now than they were 100 years ago. We are making a chocolate cake. He was taking his time to get ready. I am agreeing with her analysis of the situation. while fleeing she burst into tears. I know you are lying to me! You should water your plant more because I think it is dying. The little boy is tying his shoelaces. The policeman is stopping the traffic. We are planning a surprise party for our teacher. I think I am getting a cold. The student is answering to the question. I am offering you a special deal. He is now suffering the consequences of his actions. I wonder what he is whispering in her ear. She is admitting to be strict with her children. They are preferring to have a football match tomorrow. 8. If the verb ends in consonant + vowel + L, we normally double the final L and add ING. I have been travelling around South America for 6 months. He was marvelling at her beauty.